While the majority of hawker centres are closed by the early evening, Sin Ho‘s dinner service was just picking up its pace when we arrived around 6pm. The stall was not difficult to find, being the only one with a brightly lit sign and full of noisy chatter, as the owners took orders from their customers. 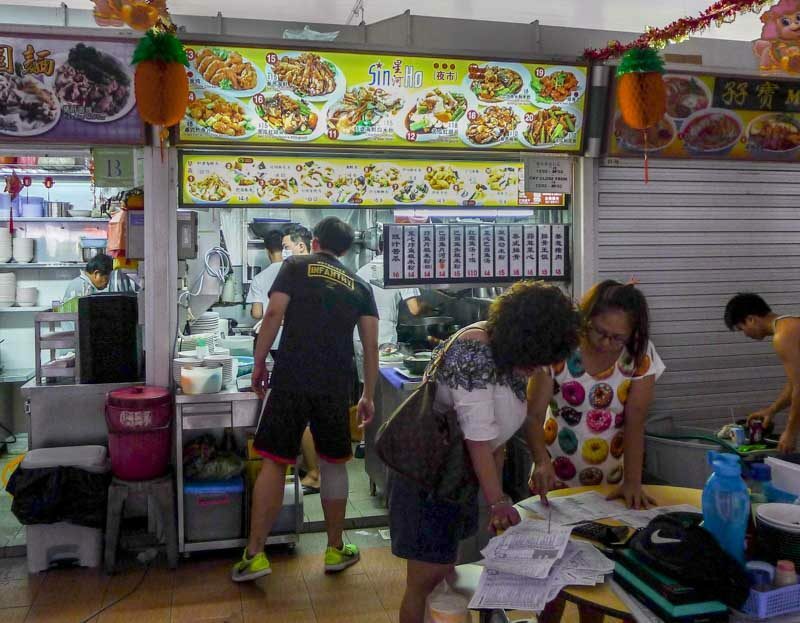 This humble stall sells fish soup in the day, and turns into a zi char stall at night, serving up Cantonese-style wok-fried dishes as well as seafood soup. 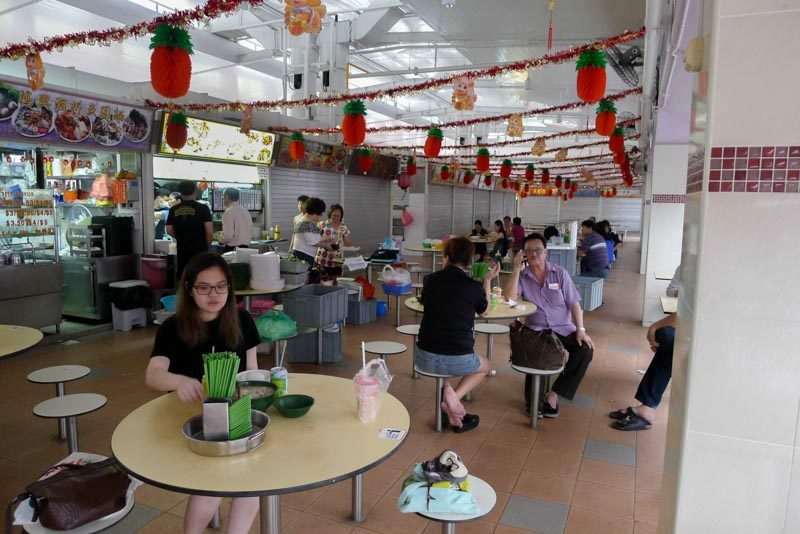 The seats near the stall were occupied by Sin Ho’s customers, eagerly waiting for their orders to be served. I noticed that almost every table had an order of their popular Har Jeong Kai, and I was excited to order a plate too. The crowd tended to flood in steadily after 7pm, so get here early if you don’t want to get caught up in the queue and long waiting times. 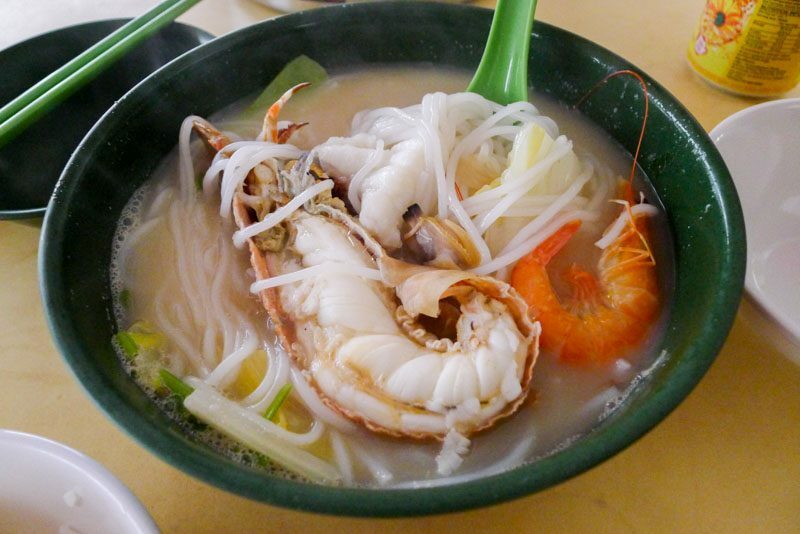 We had an order of their bountiful Crayfish Seafood Soup with thick rice noodles ($10.50) that came with a variety of seafood, such as Manila clam, red grouper fish slices, prawns and half a crayfish. The crayfish meat was sweet and tender, and the prawns and clams were also extremely fresh. The highlight of this dish was the soup, which was flavourful and had no fishy smell at all. We had this with thick rice noodles, but I think it would go nicely with a bowl of rice too! This was my second favourite fish following the prawn paste chicken wings. The Mixed Vegetables Stir-Fry ($8) is a little bit more pricey than most vegetable dishes outside, but we understood why when it arrived at our table. 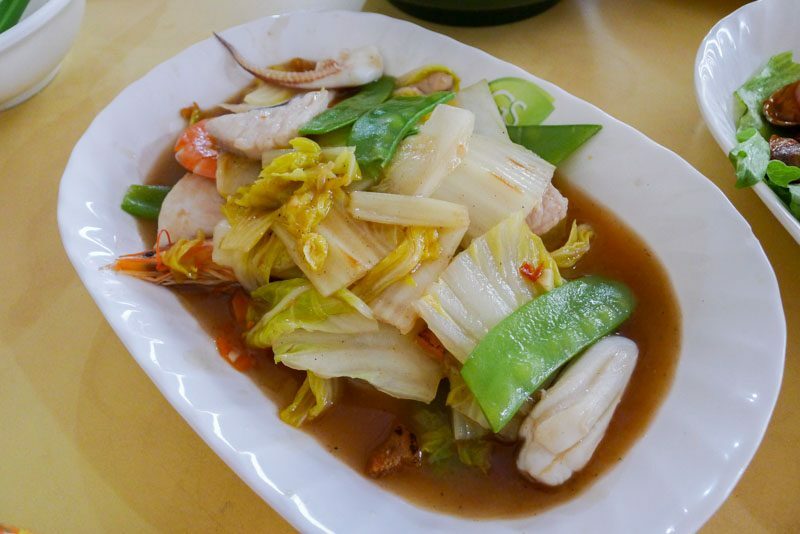 It was a medley of seafood, pork slices and vegetables, wok-fried and left to simmer in a broth (we think the same seafood soup) with lots of lard. The sauce was aromatic and savoury, and complemented well with the sweet snow peas and Chinese cabbage. Amongst the seafood in the dish, I was surprised to find slices of Batang fish and sotong as well! Making for a plentiful and tasty vegetable dish, I could totally see myself coming back and ordering this dish, accompanied by a bowl of rice. Yes, it’s THAT good. The Sambal Lala ($10) was pretty mild in spiciness but was flavourful to boot. It came stir-fried with chunks of pineapple and shallots, and was made even more fragrant because of the lard used. 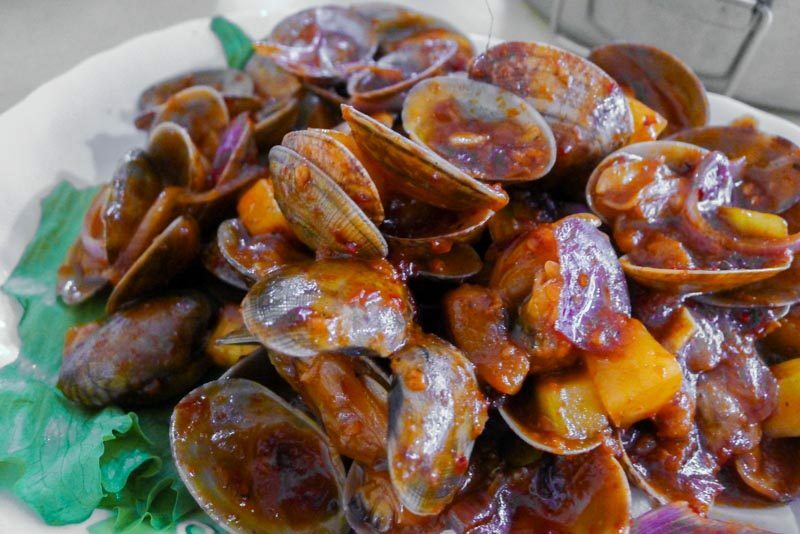 The clam meat was tender and chewy, when paired with the fragrant sambal, makes for a great side dish with the meal. And the dish I’ve been waiting for the Prawn Paste Chicken aka Har Jeong Kai ($7, small), is a one that will appeal to both adults and kids alike. 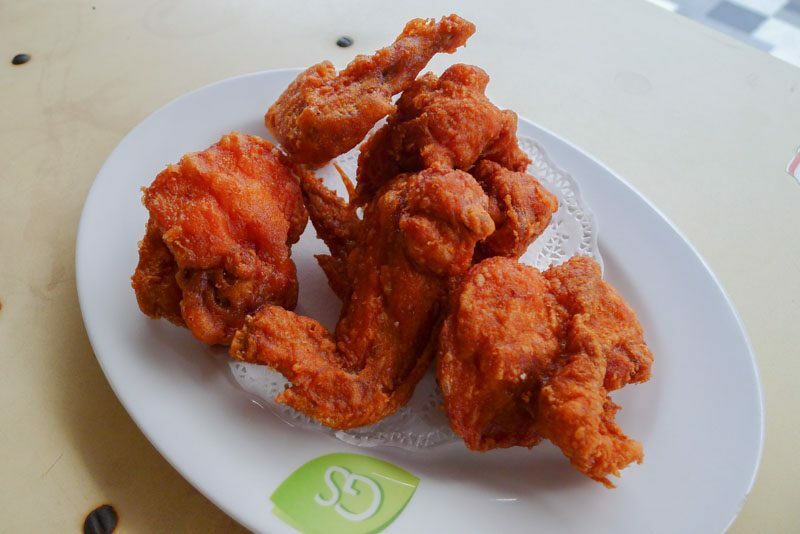 Crispy and savoury, the chicken wings are fried to a beautiful golden red colour. The moist chicken meat itself was rich in prawn paste flavour, and I would highly recommend that you come and try this dish for yourself. Authentic Cantonese zi char at its best, Sin Ho is one of Bedok Central’s hidden gems for dinner. As most of the stalls are closed during dinnertime, look out for the stall’s self-service cooler box with an assortment of canned drinks that you can get for $1 each. Will definitely be back here to try more of their wok-fried dishes, such as the Seafood Hor Fun, and of course, more of their addictively crunchy Har Jeong Kai. Sin Ho: #01-75, Blk 216 Bedok North Street 1 Singapore 460416 | Opening Hours: 8.30am – 2pm (Lunch, Wed-Sun), 5pm – 9pm (Dinner, Wed-Sun), Closed on Mon – Tue.